I stumbled on this about to start on TV a couple of nights ago and watched it again - for about the 20th time. I still think it is an amazing film - both cinematically and in terms of developing the whole Matrix universe and crucially provides the pivot and development for the trilogy's story in preparation for the concluding chapter. The Matrix is still my number one film - I've seen it over 50 times. I wrote my Masters thesis on Neo as a Christ figure before Reloaded and Revolutions came out. I will try to be objective but it's not always as easy as it seems! The visuals are every bit as stunning as in The Matrix, but because of stylistic familiarity they make less of an impact. The balletic quality of the choreography of the fight scenes is pure visual magic. The story line is not straightforward and is developed by characters whose roles and personas embody the development of the narrative. The mutated and viral Smith(s), Seraph, the Oracle, the Merovingian, the Key-Maker and the Architect all combine to deliver riddles and conundrums that Neo must solve if he is to fulfil his prophesied destiny as 'The One' and bring salvation to the people of Zion. All this unfolds as Morpheus' faith in Neo holds firm as he battles the sceptics in Zion's military. The Council of Zion as guardians of Zion's heritage and custodians of its future, buy into the prophecies and do what is necessary for Neo to navigate his way through the choices and controls The Matrix confronts him with. Knowing what is real, whom to trust and the outcome of any given choice are the things Neo must constantly weigh as he continues on his pilgrimage of salvation. This is archetypal post modern cinema where the polemics between truth and untruth, individuation and community, machine and humanity all play out. 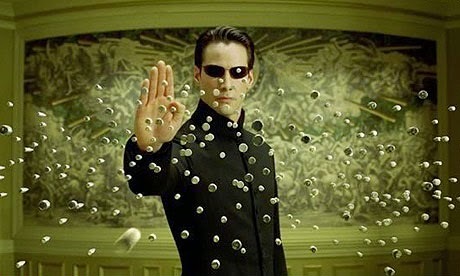 The original The Matrix was released in 1999 on Good Friday for a good reason and as we are in Eastertide as I write this, the parallels are plain to see (although the religious and philosophical motifs are certainly not all exclusively Christian). Many people have been critical of this film as being too long, too slow and generally a disappointment. It may be a tad too long but if viewers were hoping for another quantum leap of the order of magnitude that The Matrix gave us, I feel this places an unrealistic burden on the film. I enjoyed watching it again and will do so in the future. I now feel spurred to watch Revolutions soon. I will keep the faith and award this 8/10.